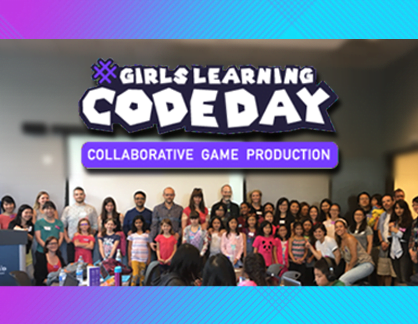 XDS is so proud to have partnered with Canada Learning Code (CLC) to bring Canada the fifth annual Girls Learning Code Day. XDS worked with CLC to help define a brand new format for this annual event – a collaborative game production workshop. In the true spirit of external development, learners had the chance to explore the game industry by experiencing what it’s like to work on different project teams, within a variety of roles – from creating the artwork, sounds, background music, and the game itself, from pre-production to post. Across the nation, 699 youth learners participated nationwide, for a total of 1398 participants, who were supported by 307 mentors, in 31 cities across the country! You can look back at all the amazing Magic Moments that were captured on twitter using the hashtag #glcCodeDay. Click here to see all the amazing experiences that were shared! Canada Learning Code has also created a Digital Arcade, where you can play actual games that learners created during the day. Thank you to all XDS’ers (and of course, Canada Learning Code) for helping to make this day possible!